I love this nutrient rich salad with ribboned carrots and sea spaghetti in a lemon and tahini dressing. It’s vibrant, earthy, crunchy and packed full of calcium, iodine, betacarotene, selenium, vitamin C, B vitamins and so much more. Sea spaghetti is a kind of seaweed I’ve been getting from a couple of local health food shops. It’s from the Spanish Atlantic, is really easy to use and quite a palatable introduction to seaweed. It’s not too strong tasting, but still adds a mineral flavour that works well with the sweetness of the carrot, especially when cut with the gentle acidity of the lemon juice. 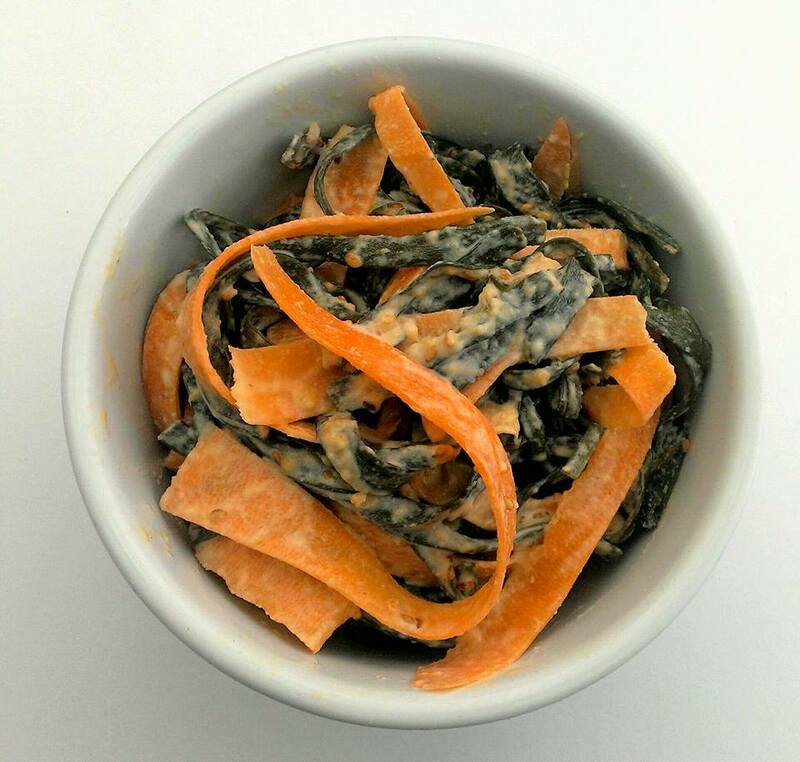 You could also use wakame or a number of other different types of seaweed instead. 3. Stir the juice and zest of half to one lemon into 2-3tbsp raw or light tahini. Stir vigorously until smooth, adding a little water to make a thick, creamy consistency. Season with a little tamari (wheat-free soya sauce). 4. Rinse and drain the seaweed and mix all the ingredients together.